Sea turtles (superfamily Chelonioidea and Dermochelyidae) are marine reptiles that inhabit all of the world's oceans except the Arctic. The superfamily Chelonioidea has a world-wide distribution; sea turtles can be found in all oceans except for the polar regions. Some species travel between oceans. The flatback sea turtle is found solely on the northern coast of Australia. Sea turtles are almost always submerged, and, therefore, have developed an anaerobic system of respiration. Although all sea turtles breathe air, under dire circumstances they may divert to anaerobic respiration for long periods of time. When surfacing to breathe, a sea turtle can quickly refill its lungs with a single explosive exhalation and rapid inhalation. Their large lungs have adapted to permit rapid exchange of oxygen and to avoid trapping gases during deep dives. 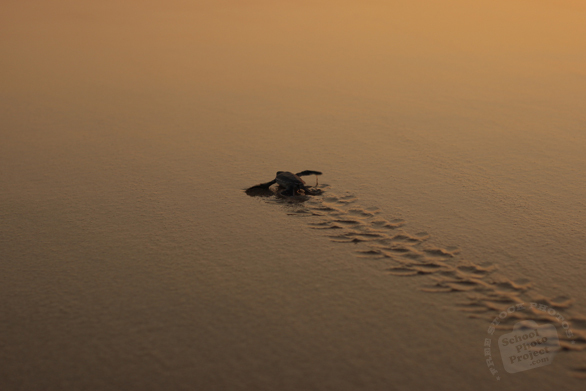 However, sea turtles must emerge while breeding, given the extra level of activity.